This post is a quick review of Mahindra Holidays and Resorts Pvt Limited (MHRIL)’s Coorg facility, known by the name: Club Mahindra Kodagu Valley, located 5 kms off Madikeri (Mercara) Karnataka. Food is excellent- at par with any of the five star hotels I’d been to. No complains on that front. I was expecting them to serve some local food, on banana leaves, but the menu is standard one that can be found in any buffet. Unknowingly I asked for an item which was not there in the menu, they still arranged it. Resort has all basic and modern facilities- Pool, Gym, Ayurvedic Center, An adventure Zone, Indoor Games center, Beauty Parlor, Coffee Powder shop etc. Musical equipments were arranged on request. There was no wi-fi for laptops but internet center is available at Rs 60 per hour plus tax. Several activities are conducted as per schedule-Refer image for activity chart. If you don’t have a membership accommodation per day costs between 4k to 7.5k plus tax. 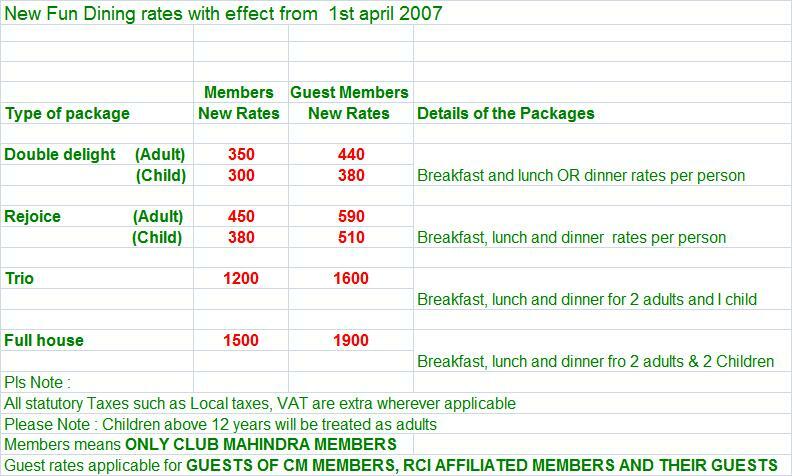 Please check Club Mahindra website here for current prevailing prices for non members.Refer this chart for Fun dining pricing. Activities: Many of them are free, some are billable. 1. I could notice that staff are from various parts of India. Usually hotels hire local staff as it is economical. (Outstation staff demand higher salary and will need accommodation and occasional long leaves). CMKV has staff from all over India speaking different languages. Because of this, chances are high that you’ll find someone speaking your mother tongue. This diversity should also help CM understanding custom needs of guests based on their local preferences. 2. Space is the basic difference between a five star hotel and a resort. You might get similar food and similar room for cheaper rate elsewhere but here you’ll pay premium because of location. 3. Several creative initiatives could be seen in most of their services. 4. Staff were friendly and helpful. There weren’t any reasons to complain. Our guide, Mr. Joy was extremely joyous-He kept his smile throughout the day till late night, hiding his tiredness. Quite knowledgeable on local geography, language, history and the science of coffee plantations. 5. Using electric vehicles is a good idea. 6. Besides basic items like bath soap and shampoo a set of other herbal and ayurvedic products were provided in the bathrooms, in relatively bigger bottles. Finding fault with CM is not my intention here. Personal observations/suggestions only. Listing possible improvements as guests will have very high expectations. 1. Mobile Signal (Airtel and few other service providers) was very weak. I appreciate the idea of staying disconnected from the world and enjoying the holiday but occasionally one needs connectivity. We could catch signal at open areas. Reliance mobiles were working indoors as well. I personally feel it will be good if Cm can give its guests a taste of local food. That will be a very good value addition in my view. Since rooms are built in independent buildings, there’s no centralized hot water supply facility and hot water comes from geysers assigned for each room. As you know geysers take their own time to heat the water and can supply only a limited quantity of hot water at a time. Well, this serves the purpose but if you want to spend long time under shower you’ll run out of hot water soon. Same when more than one family member wants to take bath quickly. Most of the star hotels do not rely on geysers and will have centralized heaters which can supply unlimited hot water almost instantly. This one applies to all hotels. As a power saving feature, electric supply to all ports inside the room will be cut off once you remove the key card and lock the door. Because of this, you wont be able to charge your laptop or ipod or mobile or other device when you are not in room. What I suggest is to have one socket in each room which will have continuous power supply. Since temperature in Coorg is already chilling, I feel it will be a good idea to provide warm water in the pool. 7. Some guests may wish to use bath tubs. Club Mahindra Kodagu Valley is well designed, spacious and fully equipped to provide best possible service to guests. But if you're extremely sensitive about price and all you need is basic stay to sleep away the night, this resort can be expensive for you. If you prefer a spacious room in the middle of nature with lots of activities and facilities to keep you engaged and don't mind paying a premium for these services, then go for it. Mangalore is the nearest airport (around 150 kms) but road from Mangalore to Coorg is very bad. Bangalore is the next nearest Airport (270kms)-Road from Bangalore to Mysore is excellent and from Mysore to Madikeri is good enough excluding few stretches. Bangalore-Mangalore railway route will be opened today-I need to check what will be the nearest railway station. 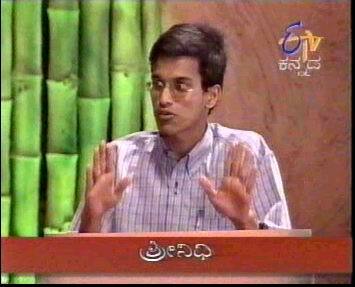 hey i am sorry to distract you from the topic, how come you have not written anything on karnatka politics? I would love to read your comment on that. Will write something if possible. Thanks. Have good time with your CM package. Yeah! It’s free for you, and since it was ’sponsored’ you have every right to give a vote. But it comes out totally as ’paid marketing’. Sorry, not for me. Please note that I was under no obligation to write this review and I believe I’ve written a transparent review. I’ve listed all cons I could identify. All facts mentioned in the review are open for criticism. I’m wrong anywhere please correct me. For a start, you missed out on the pricing for members and non members. That would have actually added value to the review. Without that, it definitely looks like paid marketing. Especially as you wrote on CM earlier without a recco. Well, it’s ok to recommend products which you have obtained for free. Still, that’s just my opinion, no offence. I have a detailed pricing for food at my blog- it was not possible to include a HTML table in MS review hence I dropped it. Pricing for accomodation is available on CM’s website, Didn’t find a reason to re write it. Member pricing is already described in my review on Club Mahindra timeshare membership. Price for few of the activities and services I’ve listed in the review. My earlier review was about their timeshare membership, which I still do not endorse. This review is very specific to one of their resorts. Even I didn’t recommend their timeshare membership in my review. CM executives have given clarification for most of the concerns I;ve raised and I;ll be publishing it soon. This review is very specific to one of their resorts, which by and large is very good. But tell me if I visit their resort as a non member the cost is different na? So somehow i feel all this is related what say? But irrespective of whether you’re a member or not the product and service will be same...Only price differs..
As a non member you pay more on a per night basis, but you need not pay lakhs of of rupees as membership fee and get lot of flexibility for holidaying. A very good review indeed. Your description about the resort at Coorg reminds me of their Munnar resort, where I had been, for my honeymoon, as a one time holidayer (on a honeymoon package, which included all meals etc), Indeed it was a very memorable experience (I’ve also written a revu on that) and been to Zest Kodai also. Both places where very nice. I strongly feel it would be better to be a one time holidayer at CM rather than a member. Will check that review... For my other review just search for club mahindra in google, I’m in top 3..
DINNER Rs. 400%2bTaxes for one time holidayer. So, it’s not same for all - above rates are from CM website. The per night cost at CM works out as high as non-member as per my written review here on MS. I was told there are packages wherein you can get Breakfast plus lunch plus dinner at discounted price. I have been to your blog several times. Yes, You are/were under no obligation to write this review, but I guess unconsciously you have worn a load of this free trip as being a gentleman and non professional travel writer and you are trying to lessen this burden by writing these feedbacks here and on your blog. Just my feeling .. But you may say that as blogger, what I experienced I am tempted to write. That’ ok. But there is Club Mahindra timeshare company and there is one Club Mahindra Coorg resort. Your views are on Club Mahindra Coorg resort. And that also without any price mention. Keeping distinction becomes very necessary (after your blog ’’Never go for Club ... ’’ with all those comments putting your blog just second to CM website some how put you as voice of CM timeshare member) until you have the answer of many questions that bother Timeshare members. I still do not recommend their timeshare membership. Please check my blog for a detailed interview with Club mahindra marketing manager on various concerns I had regarding timeshare membership. I have made a sincere effort to get answers to most of the questions that bother Timeshare members. Anything else I can clarify? Plz let me know the info. Well, Karnataka Tourism Buses are not the sole factor for traffic. I have been to club mahindra as a part of our team outings (paid by my company ;) ). I think even though non-membership is a bit costly, it makes sense to go for it rather than take up membership. Regarding service, food quality and other things mentioned my nidihi, i agree with him. The location is good and is a good place to spend a holiday. Even our group met a hos there who was really fun. lot of outdoor activities also provided for a small fee. I intend to do Coorg in July 2008 -1) Pls tell me whats the weather liekly to be at that time -- rainy...? How wet...? 2) Whats the best way to get there ? Since one has to road it, which route is the more user-friendly....with less tweists & turns ? 3) Also, which route will give me teh chance to combine temples like Mookambi etc in the Malabar region ...? Will appraeciate yr response, pls. Options for travel: Mangalore is nearest airport. Roads between Mangalore and Coorg were bad during Dec last year-hope it is better now. I do not have much idea of Mookambi temple of Malabar region. Are you referring to Mookambika temple Kollur? I AM WARING YOU, TO SAFEGUARD YOUR MONEY & HOLIDAYS; DO NOT GET LURED BY THESE LUCRATIVE PHOTOS AND ADVERTISEMENTS . once You Pay for the Membership, You can’t complaint, You will have to go as per their wishes, and terms. Club Mahindra Holiday starts after 1 year of your payments, it means they just use our money for 1 full year, without interest. further they will charge as ASF ( Annual Subscription Fees ), per year, which is minimum 10 thousand, as per your choice of Holiday plans, and You are entitled to enjoy holidays only after you pay this ASF amount, after which you can enjoy only 7 days / year holidays, at their choice of resort, as you can’t get bookings, as per you chice of locations and season. The Sales Executives Offer RCI memberships, Free Holidays ( 4 days ) and Sony bravia LCD TV, HP mini Note books, etc. but to my surprise,after I have paid, the membership fees, till 3 months No specials offers were given, and when I Requested for Termination of Membership, they just ignore the requests, for months, and do not reply or refund the amounts paid. If we go on our own to any Hotel / Resort, We are customers, so we get best of all services, so we can revist, but as in this we are bound by prepayments and terms, so we can’t get best services, Yes will get some what good service, just to keep your mouth shut and get tips. Because they know, we will not or can not go else where, as we are blind members. It is better to be free So as AVOID THIS TIME SHARE HOLIDAY PLANS.